Angry Birds Rio for Mac was updated today and to our surprise there were some “bonus” images contained in the Mac App Store. 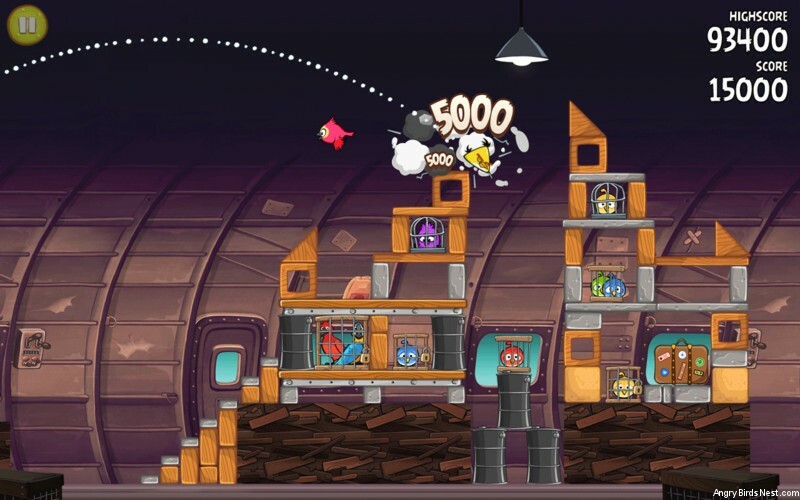 The images, which are posted below, reveal that the final episode of Angry Birds Rio will be named, “Smugglers’ Plane” and will be set inside Marcel’s plane (for those how haven’t seen Rio Marcel is the boss of the smugglers). We will likely never know if this was a serendipitous slip-up or if these could have been intentionally leaked. Regardless, it’s neat to know what we all have to look forward to. I would expect this update to land in a week or so, but I make no guarantees and have no inside info. A big thanks to Victor, Lamia and Sal9 for tipping us off to this! How did you see the new achievements in Game Centre? Or are you just speculating other than boomerang and big brother? i know the globe bird will appear. Again, as Slim has already asked you some proof, how do you know this? 5 ) Multi-Millionaire (though the amount of points is likely < 25M) 6-9) Unknown 15/10/20/20For those unknowns at the end, it is possible that it goes Mangoes / ?? / 3-star / Score Addict. Wy do you think so? There are two icons in the achievements panel: 50 flowers and 310 stars collected. 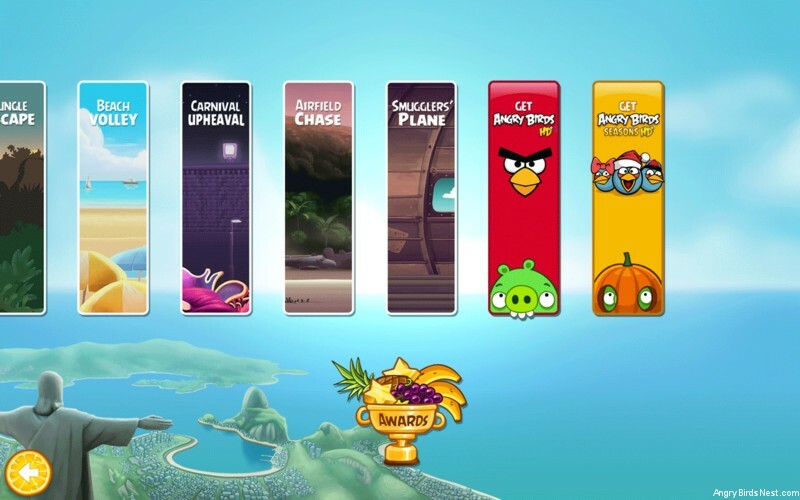 I wonder if those are the two hidden achievements that never showed up, or were scrapped by rovio. 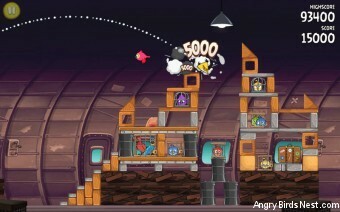 or it’s maybe a bug similar to ABO: smash maniac. 50 flowers is an achievement in “Rio Free” but not included in the full version. It’s not a bug, just the image was created for Free. 310 stars could be one. In fact, it could be the 10-point achievement that I haven’t figured out yet. It wouldn’t be bugged though — it was just created and has not been pushed to live. Surely there would be one for clearing all levels? Or is that factoredin somewhere? I don’t think so. In each level you get an achievement if you complete all levels. So if there was an achievement for all levels, there would be two achievements for the same thing. Or let’s say it like this: for completing all levels you already get 6 achievements. So a 7th achievement for the same thing does nit make sense. @sal9: where do you see those icons? Stellarvore is an existing achievement for 3-starring all levels. Not sure if that’s the question here. That’s exactly what Slim already posted above. slim, lol forgot about rio free for the flowers. did you notice that they used the mango icon for melon mania ? Jewel is on the plane in the movie so I expect that there will be Jewel alone but here arm will be broken from what I remember. The biggest boss battle ever should take place in ths update with Nigil yet again. That is what I expect. Where do you see sn icon with 310 stars? Hrm, interesting. The “melon” is literally a melon in the image, though it’s a watermelon elsewhere. But I see no image that would move either of them. Oh well, will have to wait and see. So yes, I think 310 is the 10-point achievement that I didn’t have. We know the last fruit is mangoes. I original thought grapes as well, but there is no golden grape in the data files. There are golden mangoes, however. It changes all the time. After a while it goes back to 65. It’s the same with “Cut the Rope: Experiments”: sometimes it sais “17/17 achievements”, sometimes it sais “17/19 achievements”, sometimes it shows the two missing achievements in the list and sometimes it does not show them. Yeah, just realised if you access Game centre in game, you get 65, but from game centre iitself it says 58. Grrrr….! SD looks fine to me. Still says 65 with only 2 visible. HD has been at 58 this whole time, so it may be a little while yet. Note that GameCenter changes frequently since developers must push changes to GameCenter achievements before submitting their app update for review. Like i said, we will likely see it release at the following times: 3pm, 6pm or 10pm today. What time zone you in Austin? Those leaked images did create a buz I must say. Wow, i’m embarrassed. i thought it would come out today but i guess not. oh well. I’m a Pacific Time Guy, and I’m going to check again one more time. Does anybody think that maybe Rovio will release there next game apparently called “Wine and Dine” featuring the pigs on or around the release date of the Original Angry Birds as a surprise maybe? Um what do you mean? well, there are rumors going around that rovio is in the process of making another game called “Wine and Dine” based on the pigs. Where did you get this information exactly? If the movie is any indication it might include a quasi-boss fight like Airfield Chase. I say “quasi,” as a true boss fight isn’t really possible IMO, as the birds only move on a fixed ballistic path. As far as I can tell, there are but two variables that are determinant of said path, with only that of the Boomerang Bird capable of being altered in mid-flight. That’s just my two cents worth, as I’ll quite happily take any new levels that come along, whatever they may be. Well, i was thinking that it might not come out until November 23rd but who knows. b) most, if not all of us, are on tenterhooks from anticipation. Most here are aware of when Rio was released, the empty chapter blocks had dates in them, as opposed to the more vague “coming soon” message. Now, I’m just spitballing here, but I would not be surprised to see the final chapter come out this month, as those listed update dates were most likely derived from a project milestone timeline worked out in any contract between Rovio, Fox and Blue Sky. While I realize such dates can’t be completely set in stone, due to several factors, I think it’s fair to say that Rovio will hue to such a timeline as much as humanly possible, due to potential contractual obligations. As I stated earlier, I’m just spitballing here, but I consider it to be fairly reasonable speculation. Ive noticed in the past once achievements start showing up it doesnt take but a day or so for the update so lets hope its like that with this update! So what time is it there now? To lazy to figure it out lol. Im in Ohio its almost 1:30 a.m? Never mind I googled it! :)So it will be like 3 AM here if it comes out at 10 PM in Hawaii tonight! CANT WAIT!!!!! Maybe they will only release half of the episode as usual. That’s why five if the new achievements are not shown yet. Maybe, but why would they give us a lot of achievemnts for just 15 levels and 2 birds? (big brother and green bird) They usually give us just at the max 4 achievements for 15 levels. Then they add the “3-stars all levels” and “all fruits collected” and stuff like that in the final 15 levels of the chapter. Yeah, the 3 stars are back! I can’t say if the 310 star achievement is a secret achievement or not, cos when I started the game I just got it (without having played the game. It’s the same for the Big Brother achievement. Yes, the only new achievements which were not hidden are Big Bro & Boomerang Bird. All others are hidden. – Fruit Salad and Blue Giant (310 stars) are counted and shown correctly in Game Center. – For Big Brother I received a text message that the achievement was earned, but it is not counted and not shown in Game Center. – For Boomerang Bird I did not even receive a text message that the achievement was earned, and it is not counted and not shown in Game Center. I think the last two achievements are bugged. Was able to get the fruit salad one an it shows up on my achievements list. Yh, they’re in game centre, but not necessarily ingame! They fixed Carnival Upheaval level 8-5 star error. I had to exit and restart the game to have them show up. Boomerang bird didn’t register in game center the first time and fruit salad popped up also during the restart. So you also have Stellarvore? And do you have an icon for Big Brother and Boomerang Bird achievement in Game Center? Okay, I finally got them. Now I have 59/65 achievements. Only Stellarvore is still missing. It happened to me too, signed off from GC and back to fix it. Anybody got pictures of the final half of smugglers plane? The Smugglers Plane leaked image [level] was in chapter 12.I know because I searched every level in chapter 11,and it didn’t look like it.